Made in America is alive in New England. Let us introduce you to some of our favorite Made in New England products, goods, stores and gift items. It is fun and rewarding to discover a new Made in New England specialty product or new take on a classic. You will be amazed at the local items we found! Yankee ingenuity, craftmenship and quality that is truly Made in America. NE LIVING Magazine wants to hear about your favorite made in NE specialty food or other product, contact us. Nearly everyone thinks of pure Vermont Maple Syrup when they think of Vermont products. But Vermont Products means much more – check out the Vermont Vermont Products Guide from VT LIVING.com for more Made In Vermont products, gifts and services. “Live Free or Die” is the official state motto for New Hampshire though for some, the way of life is “Live Green or Die” – check out the locally made and sustainable goods made in New Hampshire Products. 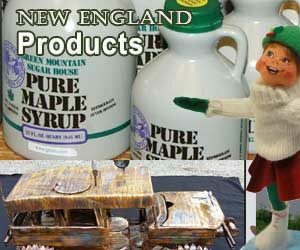 New Hampshire Maple products and real maple syrup are just a few of our favorite Made In New Hampshire Products. Owners Dave Boudrias & Dona Drapeau have been producing Maple Syrup since 1994. Stop in and try their specialty, Maple Barbecue Sauce. The maple barbecue sauce is a homemade product created by Dona. Using the B- Grade syrup, for the richest flavor. The added spices, give it a spicy kick. It's a versatile sauce that can be used on everything. For recipes go to our website. Welcome to Vito Marcello's Italiano Bistro, where our home made pasta servings fill any hunger! For three generations only the finest and healthiest ingredients have been used to create the Marcello Family's gourmet pasta sauce. Vito continues this tradition and is proud to share his authentic Italian pasta sauces and dressings for you to enjoy at home. Bring home some Made in Maine Products during your Maine Adventure. Support local art and bring home a one-of-a-kind piece of artwork. Find more Maine Products in ME Living. Made in Massachusetts means goodness – just try a bag of Cape Cod Chips or a some, pure and natural Cranberry juice. Shop for Massachusetts specialty foods and more at MA Living. The days of Erector Sets being built in New Haven may be over but you can still find dozens of products made and manufactured in Connecticut. Find UConn Husky memorabilia and made in Connecticut items, gifts and specialty foods in CT Living. Visit the “Ocean State” of Rhode Island and sample some made in RI foods, bring home a souvenir from Rhode Island – plan your visit at Rhode Island Living.